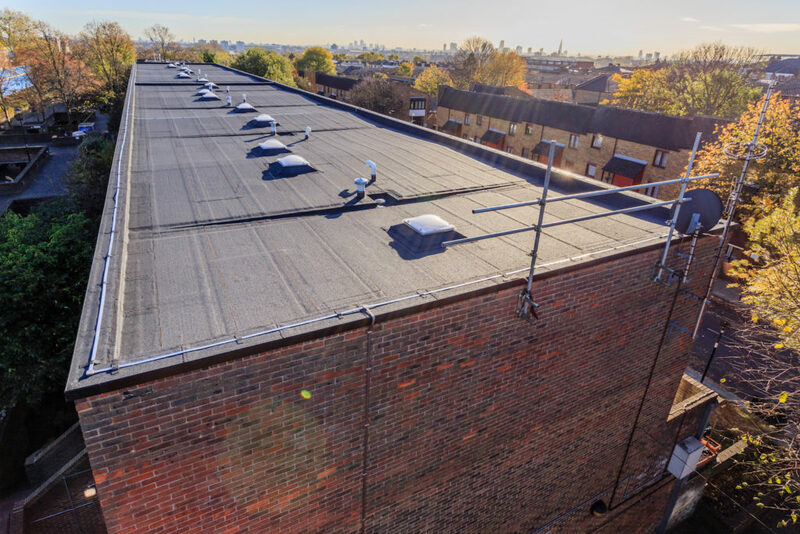 Langley Waterproofing Systems has delivered one of its high quality torch applied roofing systems and expert technical support to the award winning refurbishment of the Girdlestone Estate in the London borough of Islington. 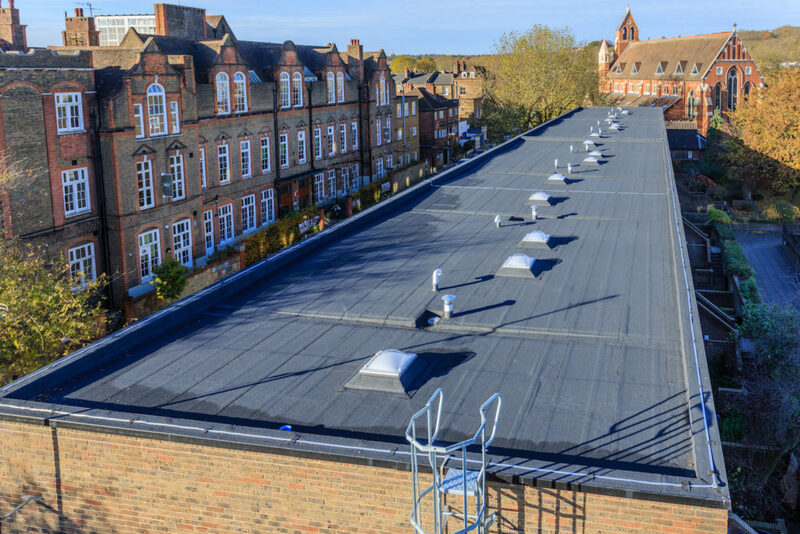 The new roof installation, winner of the Reinforced Bitumen Membranes category at the 2018 Roofing Awards, addressed persistent underlying waterproofing issues with the existing system as part of a wider refurbishment of the buildings within the estate. The shallow pitched metal butterfly roofs installed on the Girdlestone Estate during the 1990s had a long history of water ingress issues. Latent defects in the roof design and age related degradation had caused failures across the site and water had begun to enter the properties. 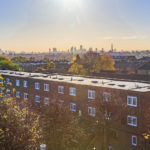 Despite successive attempts to permanently fix the roofs, the same issues reoccurred and a full refurbishment was agreed by the building owner, Islington Council. As part of its asset management services, Langley had been working with the Borough for more than eight years, advising them on management of the roofs’ condition. To fully understand what was required, Langley worked with one of its approved contractors to remove a section of roof and inspect the condition. Evidence of serious issues with the roof was discovered including extensive saturation of the mineral wool insulation. As such the only option was to strip the metal roof and install a more suitable, redesigned system. The new system included Langley’s TA-20 premium high performance torch applied SBS elastomeric membrane for warm roofs. The chosen solution also featured specifically designed tapered insulation to ensure efficient removal of rainwater from the roofs. TA-20, which benefits from a 20-year insurance backed guarantee, was selected to provide a robust membrane with a non-slip granular surface to ensure durability and puncture resistance for maintenance foot traffic. The renewal of the roof was part of the overall refurbishment of the buildings, with Mears carrying out external works at the same time. The ambitious programme required a proactive approach to the design of the roof. As the work was being carried out on a tight timescale and with no temporary roof structure in place, the standard lead times on the manufacture of elements such as the tapered insulation were too long. To overcome this challenge Langley drew on intimate knowledge of this type of construction and the site itself to prepare the required components ahead of time. Drainage calculations were made and tapered insulation; rooflights and outlets were manufactured based on the assumptions from one block. An inspection of the original roof was completed on the day each was exposed, allowing any changes to design to be implemented immediately. In close collaboration with the client and contractor partners, a rolling programme was established to complete the work to schedule. Langley monitored the install throughout the process to help ensure the highest quality installation and provide technical support as required.